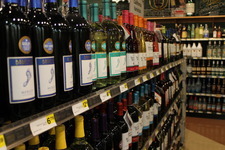 For an extensive variety of fine wines including many local selections and the coldest beer in town come to Richter's Marketplace. We know that beer tastes best when cold, so that is why we have a large walk in cooler. We have a wide selection of domestic & imported beer including a wide variety of Wisconsin microbrews. We also carry an impressive variety of your favorite spirits, liqueurs & cordials. Not sure of what wine to serve with dinner? Check out our Wine Pairing tab and let us help. Can't find what you are looking for? Just ask and we can help you find it.